Garmin is a company well known for being on the cutting edge in the world of GPS technology. But what if a trusted company like Garmin branched out into the world of smart watches, specifically targeting runners? The result would be a tough, easy to use and highly advanced product like the Forerunner 620. Garmin’s Forerunner 620 builds on their previous concept of designing a smart watch that can track a runner’s data including distance, time, heart rate, and pace. While these basic functions are still within the Forerunner 620, Garmin has upped the ante by including even more features that a runner will find invaluable. As in previous models, the Forerunner 620 is waterproof and lightweight, weighing in at only 1.5 ounces (or 43.6 grams). It is designed with comfort in mind, featuring a flexible band designed to combat perspiration on those long, hard runs. While the face of the watch is bigger than previous models, it still manages to be streamlined and stylish. The larger size of the module offers a touchscreen unlike other smart watches in its class. This watch will not spend its life on charge. Its rechargeable lithium-ion battery offers a longer charge life than previous models, at ten hours in GPS training mode and up to six weeks in normal watch mode. An added benefit is the Garmin Forerunner 620 has a larger memory capacity, storing data for about 200 hours of workouts. The Gamin Forerunner 620 is GPS enabled with a high sensitivity receiver. Unfortunately this watch, like Garmin’s offerings before it, does not permit the loading of maps. It will track your run, however, and map your route as you go. So what makes the Garmin Forerunner 620 a contender? It is hands down the upgraded technology within the watch. Unlike previous models, this version features some exciting steps towards instant data sharing such as real time automatic uploads to Garmin Connect, Garmin’s free online community. The Forerunner 620 even offers a “virtual digital partner” to train with to increase a runner’s motivation. The watch itself has exciting features such as pace alert, a feature that alarms to show the runner if his or her pace is changing during the run, a time and goal alert that tells the runner when a goal has been reached, an auto lap feature that automatically starts a new lap after a preset distance, a calorie burning record, and an auto pause feature that will stop the watch if the runner slows or stops and resume when the runner moves again. The Garmin Forerunner 620 features advanced cardio stats. It will measure the effects of a run against overall fitness levels, calculate VO2 (oxygen usage) statistics, and estimate recovery times. A color chart on the watch face will keep the runner aware of oxygen usage and the watch will match a runner with his or her potential running times based on past history. The Forerunner 620 even calculates how much recovery time a runner will need between workouts, whether it is days between hard runs or hours before training can be safely started again. 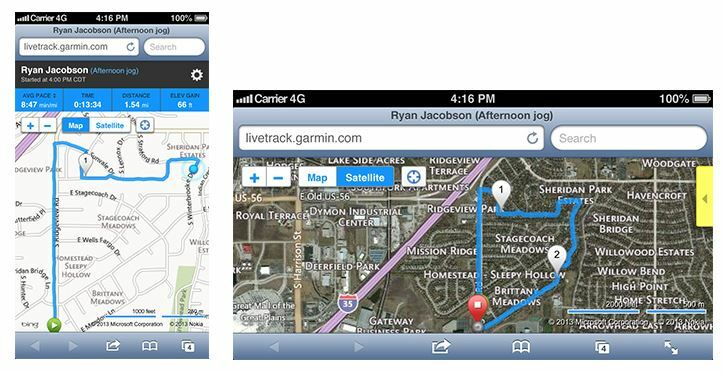 Garmin Connect is a free information tracking and sharing site offered to Garmin users. The Forerunner 620 can wirelessly connect to your phone and send information to the site automatically. 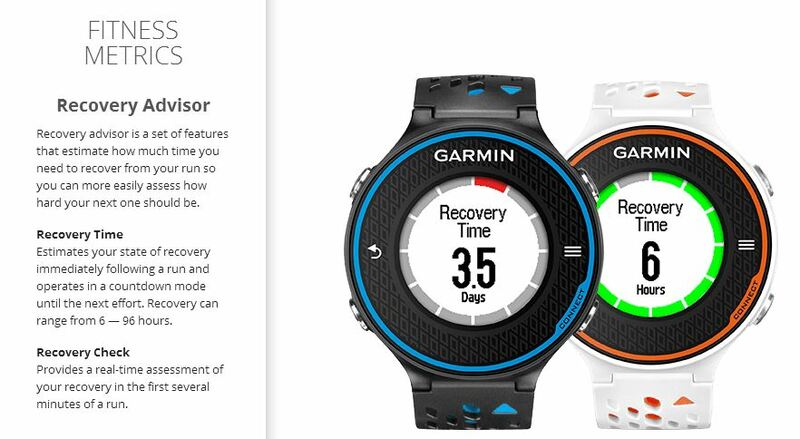 Garmin Connect offers free training plans to Forerunner 620 users; this is the closest a runner can get to being able to wear a coach on their wrists. Users can track their own progress and measure it against others within the friendly online community. The Garmin Forerunner 620 offers an optional heart monitor that, when paired with the watch, keeps detailed information on cardiac output. The advanced heart monitor is designed to measure running dynamics such as the bounce (vertical oscillation) in each step as well as cadence and ground contact time. It measures heart beat and cardiac output like previous versions of the monitor. While the Garmin Forerunner 620 currently doesn’t offer many color options, it makes up for this minor downfall in advanced technology. Add on options include the heart monitor, carrying case, foot pod, and even a bike sensors that allow riders to use this watch as well. The Forerunner 620 starts at $399.99 for the watch and charging cradle only, or $499.99 for the watch with heart monitor. This entry was posted in Garmin GPS Running Watch and tagged Garmin, Garmin Forerunner, Garmin Forerunner 620.